I recently bought a 9 months old German Shepard dog from a young couple in belize. They told me they got him as a pup in guatemala. He is calm when i introduce him to the adults in my family, but he likes to bark at my kids. I think that it is because he did not grew up around kids, but i really don't know. How could i address this problem, since i am afraid to leave him around my kids. Is there a way i could make him acustomed to them. Total German Shepherd: Two things I would suggest to you are to socialize your German Shepherd starting right now, and to also start dog training right away. This will not be an immediate fix - it will take time and patience on your part but it can be fixed if you're willing to put in the time and the work. There is one dog training class I recommend you check into and I'll point it out on this page - just click on either of the banners to learn more about the dog training class. 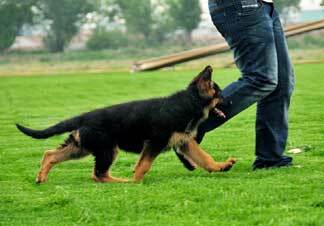 And concerning dog socialization, I suggest you read the article here about German Shepherd socialization to learn even more. Take your GSD everywhere you can safely and introduce your dog to all sorts of new things and it will build the dogs confidence - and yours too. Good luck. We rescued to GSD's and the age was a guess- about 4 months old. One is very submissive and quiet and the other is a true TYPE A! personality. We had to find balance for them - she had to learn to not be afraid of her brother (the type A) and he had to learn to respect his sister. This is an on-going process - he gets put on a leash which is his time out for oopsy behaviors. He didn't get it for a couple of days, but now when he sees the leash coming, he goes to his time out spot on his own and calms himself down. We also take them in the car frequently. We live in a very rural area so they need all the people they can get! Our precious daughter allows us to bring them to family gatherings etc. and they can then interact with her dog and learn that all the city dog barking isn't something to fear. We take them to dog stores where they can go in and see dogs and practice good behaviors... but that is only a small part of it. The important thing is that they see as many new things and learn to react to them positively - whether it is people or animals. Thankfully we also have an 11-year old female GSD who is the best teacher. She watches the perimeter fences at night and teaches them when to be cautious and how to charge up the hill and enjoy the forest. Wish everyone had a teacher like this. My puppies tended to nip at my 6-year old granddaughter... so... we put a small claw collar on the Type A male and showed her how to walk him and now she is the dominant of the two and he is obedient to her. It was good for her and for future children they may meet. I also must say in closing, this is a lifelong process - they don't need to be locked in a fenced yard all the time... they need to know what is out there in the world.. lots of controlled environments. Sit outside the grocery store door with them and people watch... lots of good things to do. Good luck - don't ever give up! Here is another technique my trainer suggested (works well when you are home). Since GSDs are one of the most people oriented breeds, they love us, and love being with us. My trainer says to start out with a social setting, perhaps the kids and you in the living room. IMMEDIATELY, when the dog begins barking directed at the kids, remove him from the situation and place him in another room. When the barking stops, you immediately return him to the "action scene". It is simply behavior modification in which he learns that when he exhibits undesireable behavior, he loses the priveledge of being with his people, in other words, a simply "time out". 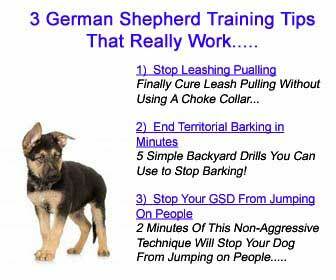 My trainer has said this is simple and works because GSD LOVE their people, and being away from their people is an effective tool. Reward when he barks appropriately (strangers etc), time out when he doesn't. Takes some time/practice but well worth the results. GSD's are super smart, he'll catch on. We had this problem with our Nicoh. He was not accustom to being around children and would bark at the neighbor kids. While I had Nicoh on a leash I would have the kids stay out of his reach and toss the ball and sticks to him as a game. It didn't take too long and he saw that children were fun to play with. We have been doing group obedience/agility training classes since he was 6 months old and keep up with his socializing. His group classes and agility trials are good opportunities for socializing. We will also go to shopping centers and practice obedience and tricks by the front door of stores along with just sitting and watching all the people come and go. A lot of people come up and want to pet him so I will introduce them to Nicoh by letting him come to them and I give them a treat to give him.